It’s hard to put into words, eloquent words anyway, what happened last night in Seattle in the Monday nighter between the Packers and Seahawks. I don’t usually like to inject my personal allegiances into my professional work, lest others think that I’m letting my feelings get in the way of an objective and measured piece. Also, in most cases, I don’t think it’s overly relevant. In this one instance though, it’s important to note that I am a Packers fan, which makes it even more difficult to try and explain the craziness from last night, but I’m going to give it a go. If you need to catch up, here are the highlights from NFL.com. What happened last night could lift the Seahawks into the playoffs. What happened last night could prevent the Packers from getting in. What happened last night could have been prevented by having the real referees in Seattle instead of the replacement ones. The three things above are unknown. We won’t know the playoff picture for either the Seahawks or the Packers for several weeks, and the unbelievable display of officiating may have happened with the real referees as well. There are also three things that we do know. First, the Packers and presumably the rest of the NFC West are pissed. The NFC North on the other hand couldn’t possibly be any happier. Second, the NFL knows how bad this looks. 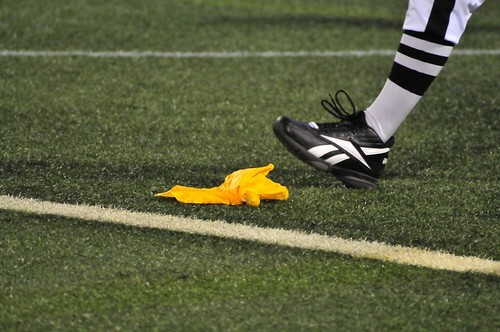 They may have had their head in the sand for the three weeks that the replacement refs have been here, but a debacle in prime time that cost a Super Bowl contender a win will surely get the NFL to at least raise their heads from the dirt. Lastly, as outraged as you or I may be, Packers fan or otherwise, we will be back. Sports, as we all know, is a drug. The NFL is the perfect drug out there, 100% legal and it comes to you on the regular. You get a small taste every Thursday, nearly overdose three days later on Sunday and get one more hit on Monday before getting ready to start the process all over again in three days. It’s a never ending cycle of gluttony, orgasmic highs and cataclysmic lows. Last night, casual NFL fans and supporters from other teams were in a state of utter disbelief with what they saw. I know this thanks to the power of Twitter, which is usually about as divided as Fox News and logic. After the game was over, there was one clear thought: the Packers were jobbed by the officials. That thought was later replaced with the notion that in the year 2012 with replay capability and all of the available technology at the feet of the NFL, that they needed to do something and give the win to the Packers. Obviously that’s pie in the sky thinking. The NFL, especially in a labour dispute with their real officials, would never undermine the work of any of their staff. #Packers clearly outplayed so far, but if this is the way the games are going to be officiated, closer games will be decided by the refs. Tonight's blown call was a "Where were you when?" type of moment. You will never forget it if you're a sports fan. That's why you watch. In some ways, he’s right. I can’t help but think though that if another major organization had spit in my face for three weeks, that I’d keep coming back for more. The power that sports has over us, the NFL in particular, is fascinating. The pull they have comes in the sixteen game schedule. For sixteen games, a period of roughly 50 total hours, you live and die with your team. That’s something that the other North American leagues, with seasons ranging from 82 to 162 games, simply can’t match. It’s going to take Packers fans and the team itself a long time to get over this one. I know I didn’t sleep much last night, and judging by the Packers players on Twitter, many of them didn’t either. They might want to try though, as the Saints come into Green Bay in six days. Once again, it’s time to start the process.